Helping alumni connect with students is how the UW Alumni Association strengthens the Husky experience — from day one to graduation and beyond. Cuisine and conversation. For many students, dorm food or cheap eats out are normal fare. It can leave them missing a home-cooked meal or wanting a dinner beyond the University District. With that in mind, UW alumni and students gathered for the UWAA program Dinner with the Pack, a celebration of shared meals bringing people together. 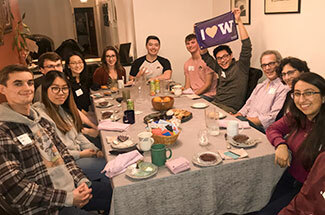 Alumni who live within eight miles of the UW’s Seattle campus volunteered to open up their homes to a group of five to 18 students for a small dinner party. They also had the option of hosting a dinner at a restaurant. Making Spring Break count. “We met so many amazing alumni who truly wanted to connect and help us undergraduates. I left the trip feeling very excited about my future post-graduation plans.” — This was UW student Olivia’s take on the Student Career Trek to Washington D.C. over Spring Break. UWAA’s Student Career Treks allow students to explore a city and its job opportunities with a little help from the Huskies who live there. This Spring Break, one group of students traveled to New York City and another group traveled to Washington D.C., where they visited companies, mingled with alumni and saw the sights together. Organizations they visited represented a wide range of interests and included NASA, Morgan Stanley, SquareSpace and the Library of Congress. The UWAA is currently taking student applications for the next Career Trek to Portland, June 17-20. Future destinations include Los Angeles and the Bay Area. Know a Husky who lives in a destination city? 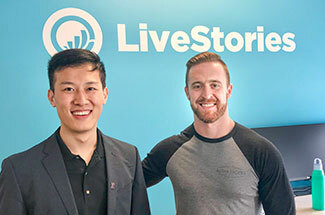 Learn what it takes to become an alumni Student Career Trek host. Lending a paw to future alumni. Think finding a career is all dog-eat-dog? Not with Huskies@Work, the UWAA’s job shadowing program. We’re coming up on the May session of this job shadowing program, which has taken place each May and November since 2016. 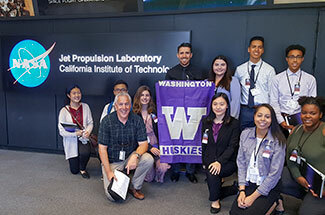 With Huskies@Work, Dawgs have been helping Dawgs with a day of connection in work places around the Puget Sound region — and even around the world. Alumni have the option of hosting students in-person or virtually.